Girls Custom Dress. Wonder Woman inspired. Tank Style Dresses run very true to size. The tanks are ribbed so they will stretch or conform to the shape of your child. We can make this dress in any size, with any number. Just state details in the notes at checkout. Please do not hesitate to message me for any questions on what size would be best for you. WE DO NOT SUGGEST UPSIZING UNLESS YOU PROVIDE US WITH AGE, HEIGHT, WEIGHT OF YOUR CHILD TO MAKE SURE IT WILL FIT PROPERLY. All of my items are handmade upon order. 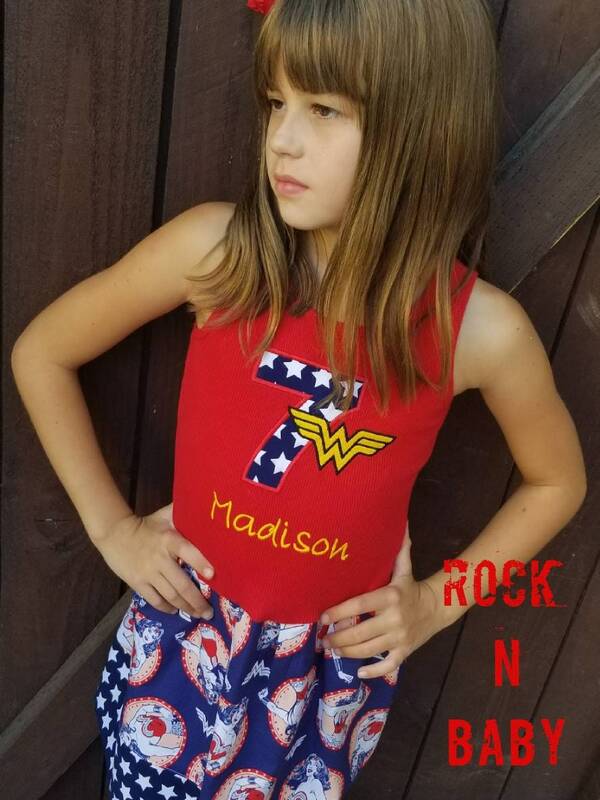 My daughter's Wonder Woman dress arrived earlier this week and looks fabulous! This dress is very well made and fits perfectly. Grace was absolutely wonderful to work with! She and I emailed back & forth about what size would be best as well as other possible fabric choices. She was extremely helpful and very attentive in answering my messages. I would definitely recommend her business and will be saving it as a favorite! SO cute! & received so many compliments!